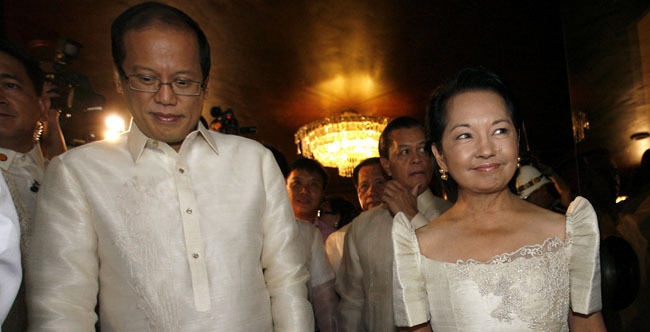 Thinking Pinoy: Why the hell was President Arroyo acquitted? Why the hell was President Arroyo acquitted? Former President Gloria Macapagal-Arroyo’s acquittal is Daang Matuwid’s bitter pill to swallow. I want to make it clear that in as far as “my personal feelings”, I am neutral to negative about PGMA’s acquittal. Actually, I was totally against it before I started ThinkingPinoy. After years of being constantly bombarded by anti-PGMA propaganda from major news outlets, I was made to believe that PGMA was the poster girl for 2000s-era government corruption. Now, I will set “my personal feelings” aside and analyze the situation as objectively as I possibly can, and let’s start with a short timeline starting from PGMA’s arrest down to the day she was acquitted by the Supreme Court. Do you still remember the melodramatic 15 November 2011 NAIA airport incident where DOJ Sec. Leila de Lima prevented Arroyo from leaving for Singapore on the grounds of a Bureau of Immigration (BoI) watch list order? De Lima said Arroyo can’t leave because the watch list order was still active [GMA]. The Supreme Court actually went to the DOJ earlier that day to give the latter a copy of the Supreme Court Temporary Restraining Order (TRO) which, in turn, orders the BoI to lift the the watch list order on Arroyo. The DOJ, however, did not officially receive the copy because they said they were already closed. Hence, technically, there is no TRO to implement, yet. Alam na palang may TRO, sinabi pa mismo ng SC na meron na, pero maang-maangan si de Lima na wala dahil hindi pa raw natatanggap. On one hand, what de Lima and her department did was legally correct: de Lima “technically” followed the rule of law. On the other hand, de Lima basically used bureaucratic red tape as a justification for her actions. The problem, however, was what happened next. Now, there is a problem. Here were a bunch of witnesses claiming electoral fraud and throughout the said Inquirer article, there was not a single mention of the submission of supporting evidence from the accusers. And then, they arrested Arroyo because she didn’t provide counter-evidence? Laway lang ang puhunan ng mga accuser, tapos hindi puwedeng laway lang rin ang depensa ni Gloria? Wait lang ha, naaasar ako personally kay Gloria, pero patas ba ‘yong ginawa ni Brillantes at de Lima? Parang mali yata. Arroyo was eventually granted bail in July 2012 after the courts found the evidence against her to be weak, based only on the testimony of a single witness [AlJazeera]. Susmarya, isang testigo lang? Hala. At this point, there are still three legal reasons why de Lima can still detain Arroyo. Let’s talk about these three reasons one by one. Third, the alleged misappropriation of some P2.32 billion meant for farm projects for her and her allies’ campaign in the 2004 elections, otherwise known as the Fertilizer Fund Scam. Those are the three reasons that I was referring to in the previous section, as cases were filed in the Office of the Ombudsman. Now, what happened to those three cases? First, Ombudsman Conchita Carpio-Morales dismissed the Iloilo Airport case in February 2012 due to lack of evidence [ABS]. Second, Ombudsman Conchita Carpio-Morales dismissed the OWWA case in October 2012 due to lack of evidence [GMA]. Third, Ombudsman Conchita Carpio-Morales dismissed the Fertilizer Fund case in May 2014 due to lack of evidence [TV5]. In short, the Aquino-appointed Ombudsman herself decided that the three cases upon which the watch list order was based are hogwash. At this point, I have reason to believe that the law mandates Arroyo to be freed, if the reason for her de facto detention are the three cases mentioned above. The problem, however, is the government filed an entirely different case before the Ombudsman dismissed all the previous three cases. First, the NBN-ZTE Case: In March 2012, the Sandiganbayan ordered Arroyo’s arrest [GMA] for having lunch and playing golf with ZTE officials while the broadband project proposal was still being assessed by government [Inq]. Second, the PCSO Case: In October 2012, Arroyo was served an arrest warrant stemming from the alleged misuse of P325 million in intelligence funds of the Philippine Charity Sweepstakes Office (PCSO). This is the first and only plunder case filed against her [Inq]. There were initially three cases against Arroyo. Those were same three cases that gave rise to her watch list order. All those three cases were dismissed. Arroyo, however, remained behind bars because of two other cases, the ones mentioned above. First, the NBN-ZTE case is about graft, a bailable offense, so Arroyo can post bail and avoid detention. Second, the PCSO case is about plunder, a non-bailable offense, so Arroyo cannot post bail so detention is mandatory. Thus, in as far as Arroyo’s “relative freedom” is concerned, we have to focus on the second case: the PCSO Scam. Voting 11-4 on 19 July 2016, the Supreme Court dismissed the Arroyo’s plunder case, citing "insufficiency of evidence" [Rap]. Simply put, she’s free. Malaya na ang lola mo. After all, the NBN-ZTE case is still pending but it is bailable. Is this Just and Fair? The four dismissed cases hurled at Arroyo share one common theme: lack of evidence. If there’s one group of people who should be blamed for Arroyo’s acquittal, it wouldn’t be Arroyo. Instead, it would be Senator De Lima, President Aquino, and their alipores, whose collective incompetence is so astounding that they can’t even accomplish something that definitely serves their personal interests. We can argue all day about Arroyo’s guilt but the fact remains that the Aquino administration had all the opportunities in the past five-or-so years of Arroyo’s detention to find the evidence to pin her down. The problem, however, is that it failed. We can argue all day about Arroyo chief legal counsel Estelito Mendoza’s shrewdness at finding every possible legal loophole to keep his client afloat, but the fact remains that the Aquino administration did not do anything to fix those loopholes. We can argue all day about whatever but the fact remains that Arroyo, despite all her shortcomings and excesses, actually followed the rule of law in as far as her five cases are concerned. I am not exactly happy that Arroyo was freed, but I have to accept the SC decision, because that is what the rule of law requires. "Dapat tandaan ng nakikipaglaban sa mga halimaw na siya mismo ay hindi maging halimaw. At kung ika'y sadyang tumatanaw sa kawalan, ang kawala'y tumatanaw rin sa iyo." The constitution itself accords the Supreme Court the ultimate authority to judge who’s guilty and in this case, the Supreme Court said Arroyo is not. Yes, the Supreme Court may have erred, but overriding the decision is not our call to make. What we can do, instead, is find ways to ensure integrity in the judicial system, something that the past administration was unable to accomplish. Let us not become the monsters we are trying to defeat. When arguing against Cynthia Patag, Jim Parades, and Carlos Celdran, make sure that you do not turn into a Patag, a Paredes, or a Celdran yourself. Amidst the brouhaha over Arroyo’s acquittal is one gigantic irony that is difficult to overlook. Just last week, the Permanent Court of Arbitration (PCA) ruled that China violated the United Nations Convention on the Law of the Sea (UNCLOS) [TP: Chexit]. The Aquino camp, led by former Foreign Secretary Albert del Rosario [TP: MVP, Del Rosario], were quick to insist that China should respect the ruling. I think that the Aquino administration forgot that International Law is NOT JUST about sea disputes. In response, Sec. Coloma said [SunStar], "The Philippines takes note of the Opinion of the United Nations Working Group on Arbitrary Detention (WGAD) and will prepare an appropriate response, according to WGAD’s rules,"
Sec. Herminio Coloma is head of Presidential Communications under the Aquino presidency. In short, the Aquino administration blatantly ignored the UN [MS], essentially the same thing China did when it ignored the PCA [Guardian]. We have been arguing ad nauseam about the Philippines’ moral high ground with respect to international law.